The biggest problem with Thanksgiving is that it only happens once a year. Not that people want to plan, cook and execute that kind of feast on a weekly or monthly basis…it’s more because the holiday appears once a year there’s a lot of pressure to fit things on a crowded table. If your guests, parents, partners, children or generally, loved ones, want a dish that has been on the Thanksgiving table since the days of yore; possibly since your Nana’s Nana first prepared them, there is a certain obligation to reproduce them. This sometimes makes it difficult for the cook/host who likes to tinker. Even by adhering to the tried and true, there’s a chance to reconnect with a recipe and put your own touch on it. The best way to do this is to keep ingredients local. No, this isn’t about the marshmallow farm near Junction City, this is about using the foods you’ll find at area markets this week to help keep your Thanksgiving recipes honest and true while proudly representing the food ethos of our little corner of the world . Take a dish like green beans and mushrooms. My Nana’s Nana would have used cream of mushroom soup and canned green beans and not the cool, ‘I canned these myself’ green beans, but actually from a can, canned green beans. I never understood what or the why of that when I was younger. But as I began hosting my own Thanksgiving, I was looking for a way to extend pricey wild mushrooms and added fresh green beans along with a little butter and cream: I understood those flavors. The worse part – I acted like I invented something that has been around for years. 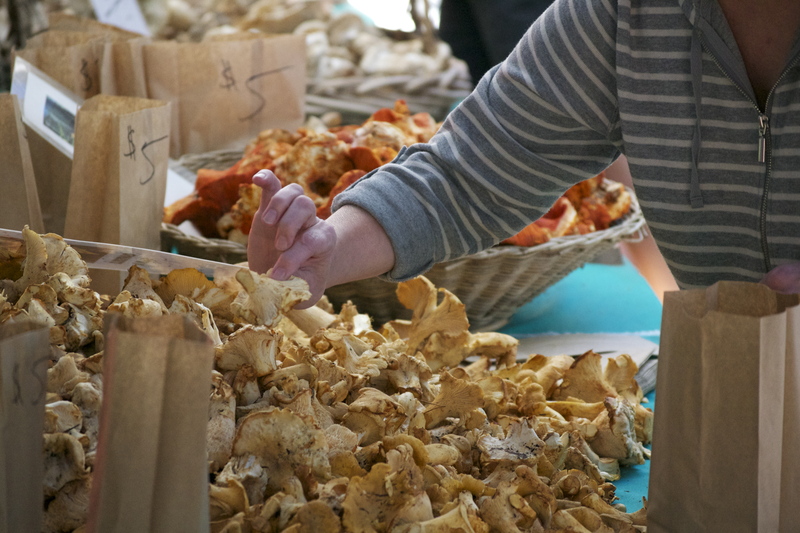 Growers had green beans this weekend, but the better find at the market will be the mushrooms. Chanterelles and wild other mushrooms abound, as they grow so well in this region’s November sunshine. Taste this classic in a new light with fresh, local ingredients. Cranberries are another necessity at the Thanksgiving table. Coastal Oregon and Washington are west coast epicenter’s . For the family Thanksgiving of my youth, we’d serve cranberry relish, cut into large rounds, jiggly, yet still retaining the shape of the can. And if you’re wondering what’s the deal with all the cans from my past – it was a small town in the Midwest. It wasn’t until I worked in a grocery store during college that I discovered fresh cranberries. Cranberry relish is really good on a day-after-turkey-sandwich, but it’s not always a crowd pleaser at mealtime. Of all the classic holiday ingredients, it’s the usually staid cranberry that has seen the wildest forms of interpretation over the years. At our less stringent Thanksgiving celebrations, think of what would happen if there was a kid’s table with no adults. And the kids were old enough to buy beer and liquor. And did. At this table, cranberries have taken the form of sorbet, been tossed in a wild rice pilaf, mixed to the most colorful cheesecake ever, a color that shattered the human capacity to understand pink forever after. But the single most popular cranberry recipe ever served was juice shaken with pear brandy and ice, served up in a martini glass. It is the taste of autumn. It’s like your mouth is visiting of changing leaves in New England. It’s cold in a warm kitchen. Everything was right about that drink…except it didn’t come with a warning to pace oneself. Also how is a possible in a room full of food, a person can forget to eat? Those are just two ideas on how to own holiday classics by keeping them the local, edible and memorable. Happy Holidays.